Agency Power Race Roll Bar - Dezod Motorsports Inc - Home of the automotive performance enthusiast since 2002. Safety is always the number 1 priority in any high horsepower or track vehicle. For years, Agency Power has used others products to keep them safe on the track. Since the release of the Porsche 997, there has been a very limited availability of quality roll bars on the market. Agency Power has worked exclusively with Agency Power to develop the best fitting and functional roll bar available for the Porsche 997 Carrera, GT3, and Turbo vehicles. And now its even better! 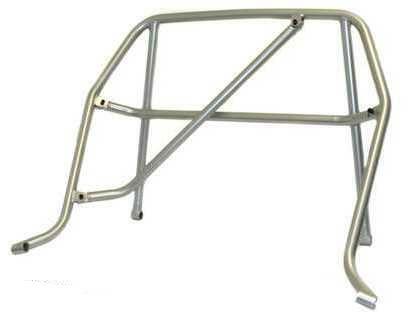 The race roll bar fits the 99-05 Porsche 996 Carrera, Turbo, GT3, and GT2 also. Needing a roll bar for our Project 997 Turbo, we wanted to have something that would provide us the ultimate in protection but also be functional for those days where you needed the back seats. Unlike other roll bars we have used in the past on our Project 996 Turbo, there is no drilling required. This roll bar is a direct fit using the factory seat belt mounting points with the CNC machined bushings included. To 1 UP the competition, we have added functionality by creating a seperate removable diagonal and harness bar. The harness bar is essential for those at the track running their 4 or 5 point harnesses to keep them secured in the seat. The diagonal bar is added safety for roll over accidents and together they add rigidity to the chassis. However both these are removable to provide full functionality of the rear seats. Each bar is independent of each other mounting securely in place with the hardware provided. Another factor we added in production of this roll bar is to lower the height for easy installation and clearance on sunroof vehicles. Other companies roll bars are really designed for non sunroof cars or full track applications. As we found out testing another product, this hits your headliner causing damage to the beautiful suede interior. Once installed, there is plenty of room to recline the seat or even move it backwards for the taller drivers. These bars meet safety regulations required by most event associations. To build these roll bars, a CNC precision mandrel bender was used to create the basic hoop shape which fits all Porsche 996 or 997 Turbo, Carrera, GT2, and GT3. The 1.5” diameter 1010 steel bars are robotically welded together. These roll bars are made exclusively for Agency Power by Agency Power and available in 3 colors for immediate shipping. Custom colors can be done for an additional charge. This item ships via oversized freight and includes all hardware needed for installation.